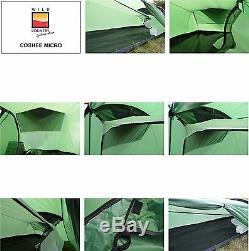 Wild County Coshee Micro 3 Season 1 Man Camping Backpacking Touring Tent. The Coshee Micro is a perfect starter tent for those looking for reliability and performance on a budget. Its 2 pole tunnel design means it is quick and easy to pitch. The inner comes attached to the flysheet allowing the tent to be erected as one. Its low, sloping wind cheating shape offers good weather protection for 2 season use and the full length door offers a huge amount of porch space. It uses Wild Country Superflex alloy poles which offer superb reliability and strength whilst remaining lightweight. The tried and tested Wild Country, high performance flysheet and groundsheet fabrics provide excellent protection from the elements - guaranteed waterproof. The small pack size and low weight make this tent equally as useful as a deluxe bivi. For those who like the Coshee style but are looking for a slightly bigger tent for solo trips, take a look at the Coshee 1. No (tent requires guy lines to be pitched). Minimum Weight: 1.2kgKg (2lb 10oz). Packed Weight: 1.4kgKg (3lb 1oz). Pitch Time (estimate): 5 mins. Pitch Type: Fly and Inner pitch together. 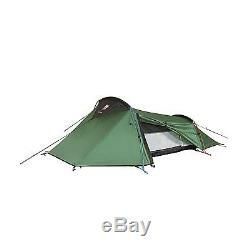 Ideal starter tent for 1. Use as a deluxe bivi. Low wind cheating shape for good weather protection. Copious porch space and 1 door. The item "Wild County Coshee Micro 3 Season 1 Man Camping Backpacking Touring Tent" is in sale since Wednesday, December 7, 2016. This item is in the category "Sporting Goods\Camping & Hiking\Tents & Canopies\Tents". The seller is "contactleft" and is located in Liverpool. This item can be shipped worldwide.